The antlers were based in bone white (Army Painter spray actually), washed with Vallejo Skin Wash, then strongly dry-brushed with Bone White again. I'm starting on the Latari with a test of my planned color scheme (Indian Summer). Looks great, but 8 colours, you are going to hate yourself shortly (my daqan will echo that sentiment). Looks great, but 8 colours, you are going to hate yourself shortly. The end result does look quite colorful... and I like it. I especially love the leaves on the base, bought from Treemendus in the UK. They're just colored birch seeds, and you could theoretically create them yourself quite easily, but buying them pre-colored is convenient (and not very expensive). The dead wood on the base is just pieces of grape stems. I dried them in the oven, then cut off little pieces to glue them to the base. I also tried to do some roots or vines using wire, but they are a bit too smooth to look convincing and I would not do them this way again. 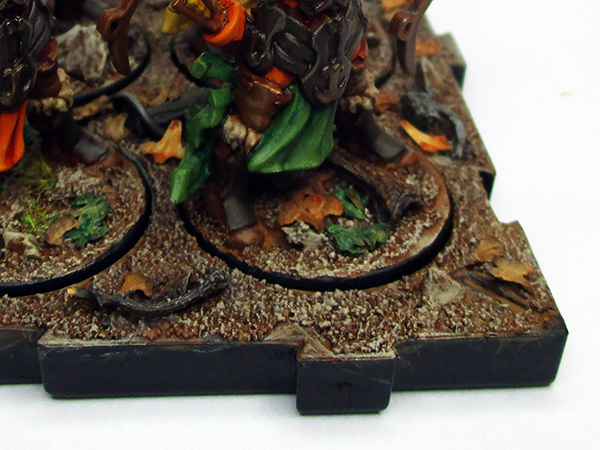 Love the bases on those elves! Great work. 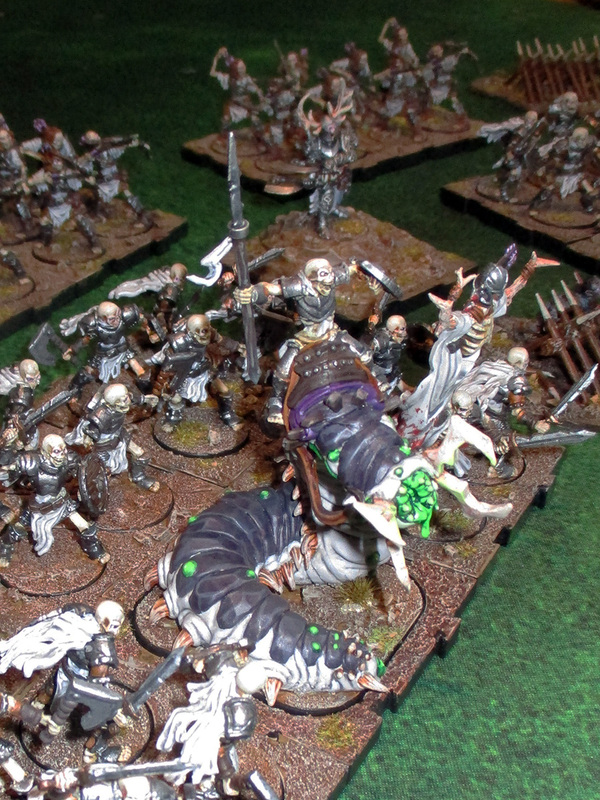 Also, those Carrion Lancers are amazing! I will be hopefully starting my ones soon but I'm currently struggling on a colour scheme. Got my first Leonx Rider finished. 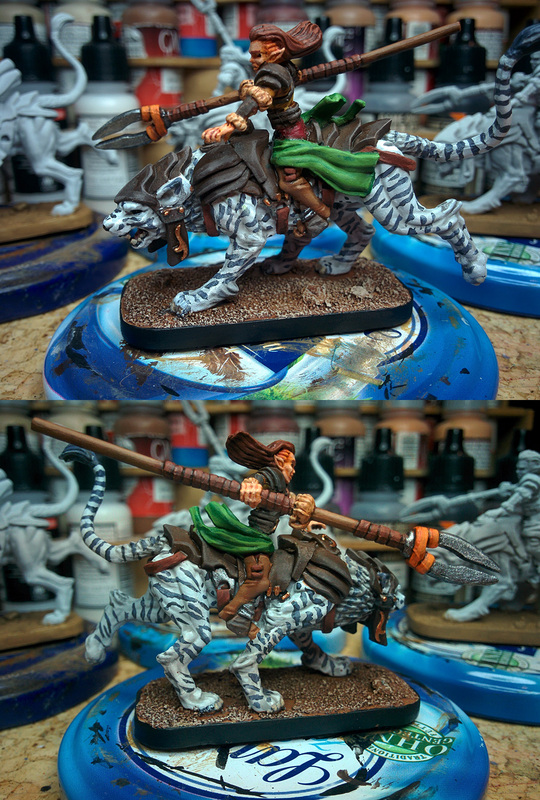 I went for a silver tabby/siberian tiger look, and am quite happy with how it turned out. Now to decide whether I want to do all four of them this way, or give them varied coloring. What does spray varnishing do? 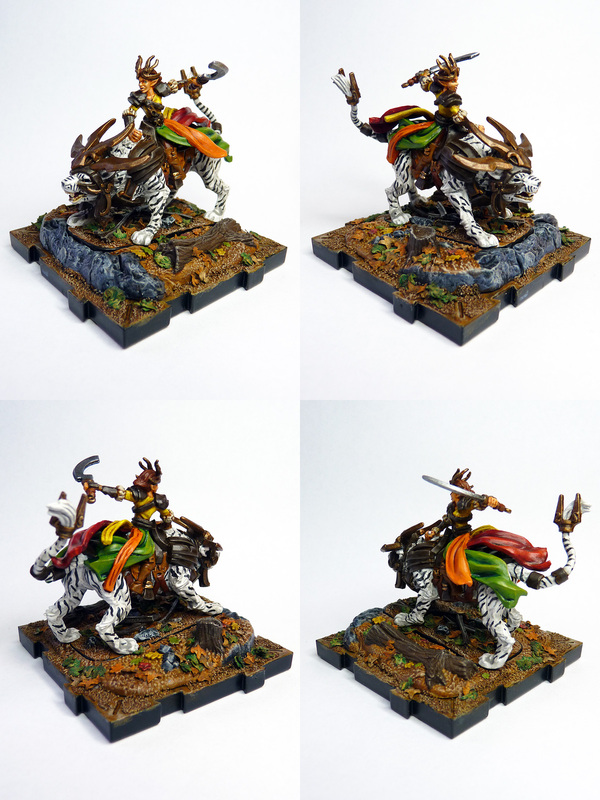 Im looking to get into miniatures painting. 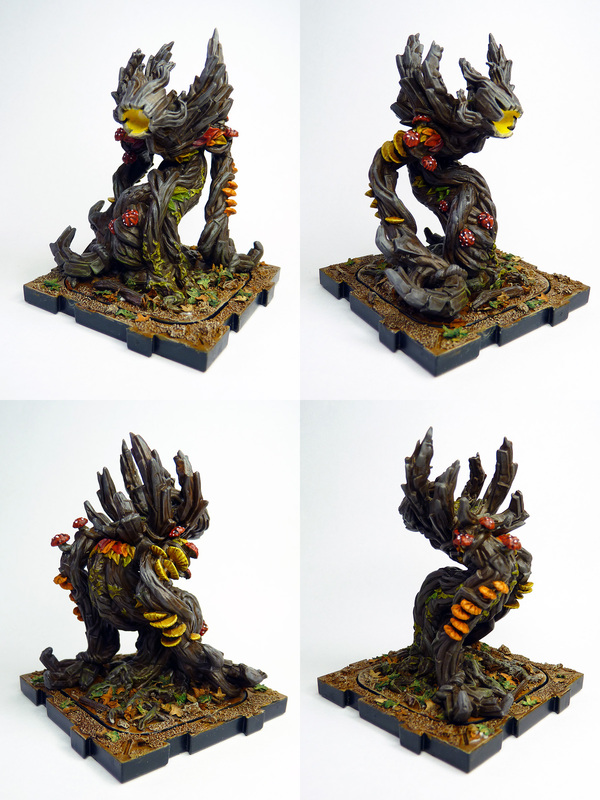 So varnishing it is a good idea for a beginner? it is almost impossible for it to hurt anything. Varnishing seals and protects your paint job so that your paint doesn't chip. Without varnish, all your hard work can be destroyed by one drop, or by too-frequent handling. Guess I’ll add it to my paint list. Any specific brands? I currently use the Army Painter Matt Finish spray. @Darthain speaks the truth! You have to use these sprays in right conditions as I think that if there is too much humidity outside, moisture can get "trapped" underneath the sealant and cause something known as "frosting" which will ruin your paint job. Apart from that scary thought, it is worth doing. If you can find yourself a place with a controlled temperature, then you're golden. I am quite lucky as we have a "paint room" at my work with loads of extractor fans and what not, so I can spray my models inside without the risk of killing myself in the future. I'm using Vallejo brush-on primer, but it results in a bit of a shine on the models, which I remove by giving the model a quick spray with Army Painter Anti-Shine varnish spray. Haven't had any problems with minis becoming cloudy or otherwise unseemly. I, too, use brush-on varnish, though I'm using some off-brand I found at a hobby store. Ghool (a competitive painter) swears by americana ultra matte, so it is likely more then adequate. Varnish isn't rocket surgery. 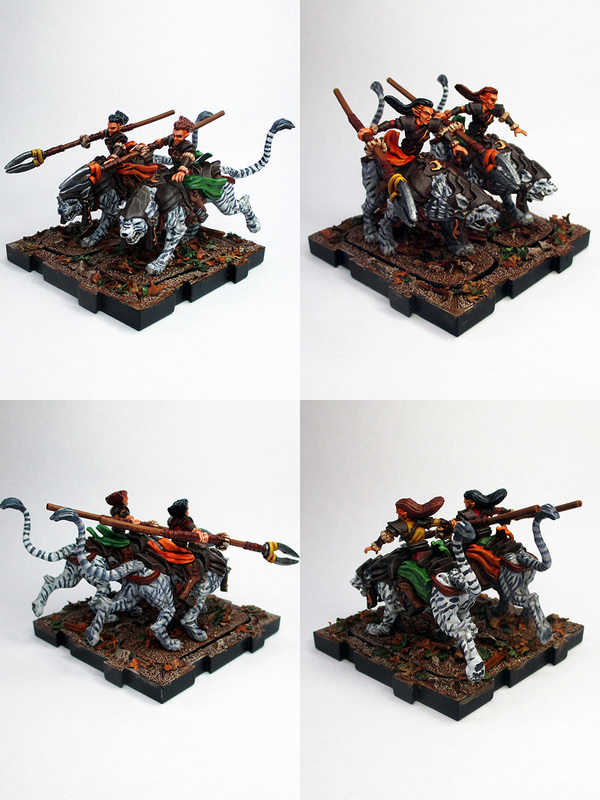 Good progress with my Latari army box, the Leonx riders are finished. 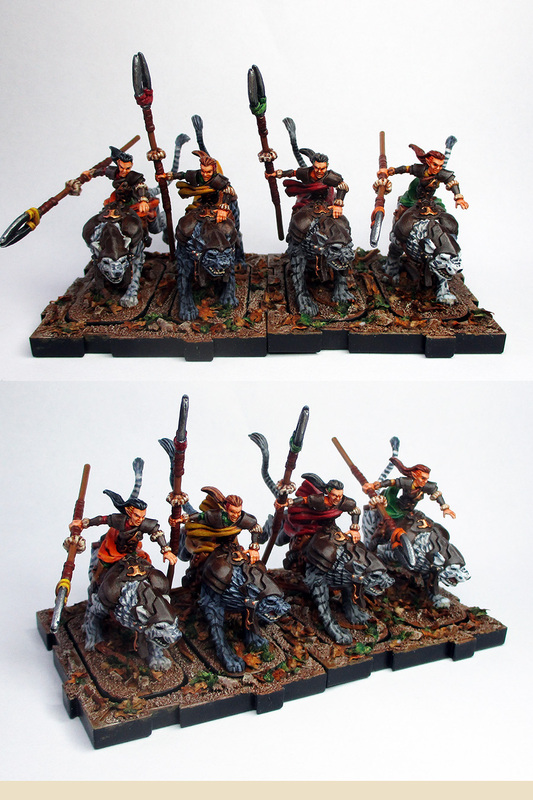 I really love these model, as they show so much movement and energy. For temperature control, i live in a very hot country so my house has a lot of ACs, would those be fine? 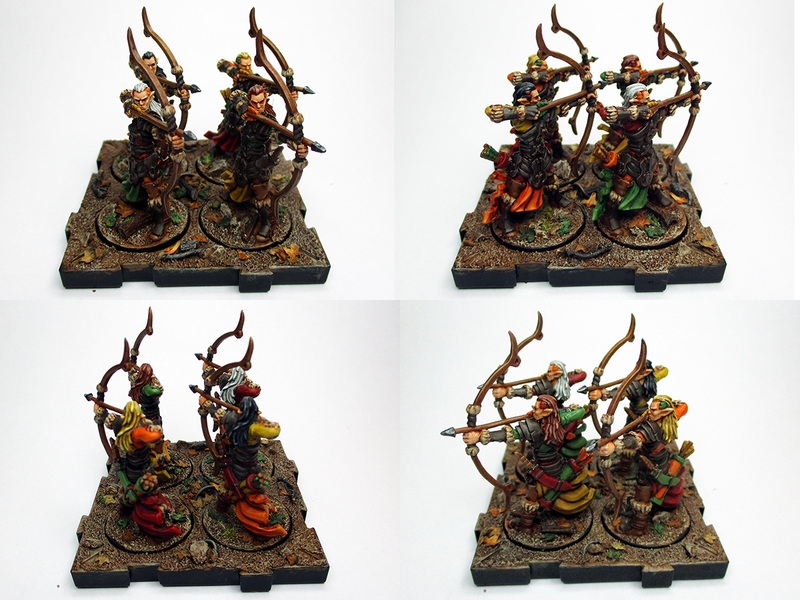 Here are some more shots of the threads titular Pale Legion - my Waiqar army - now that I have it completely painted. 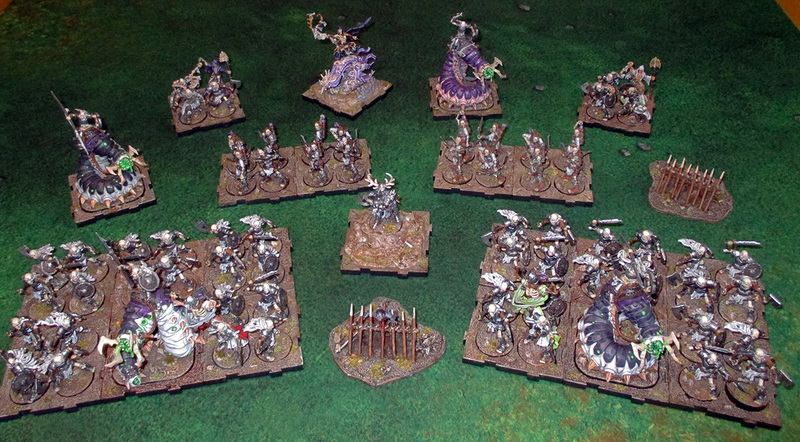 The full legion as I intend to field it in battle. And with reinforcements - i.e. the remaining painted Waiqar units. 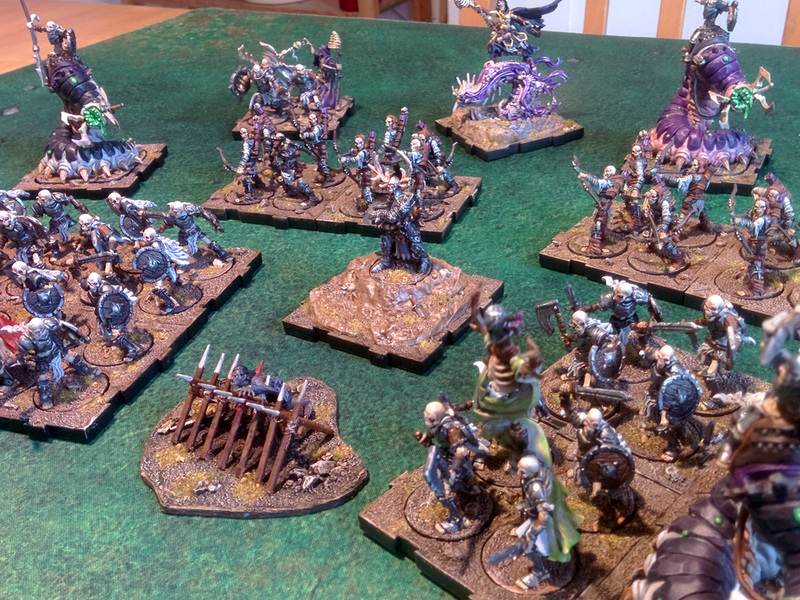 Still currently unpainted are two trays of Death Knights and two trays of archers. A shot over one of the embedded Carrion Lancers. 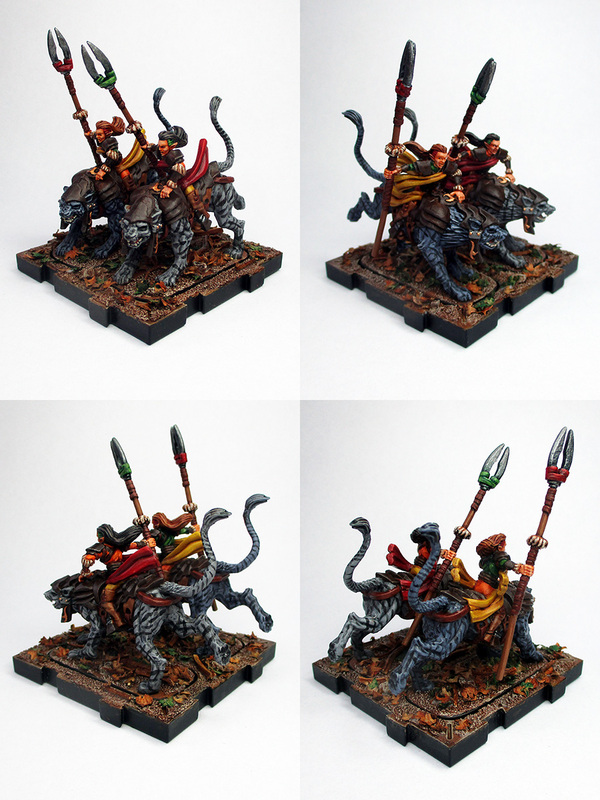 And finally the general, Ardus' Ix'Erebus, in the midst of his troops. 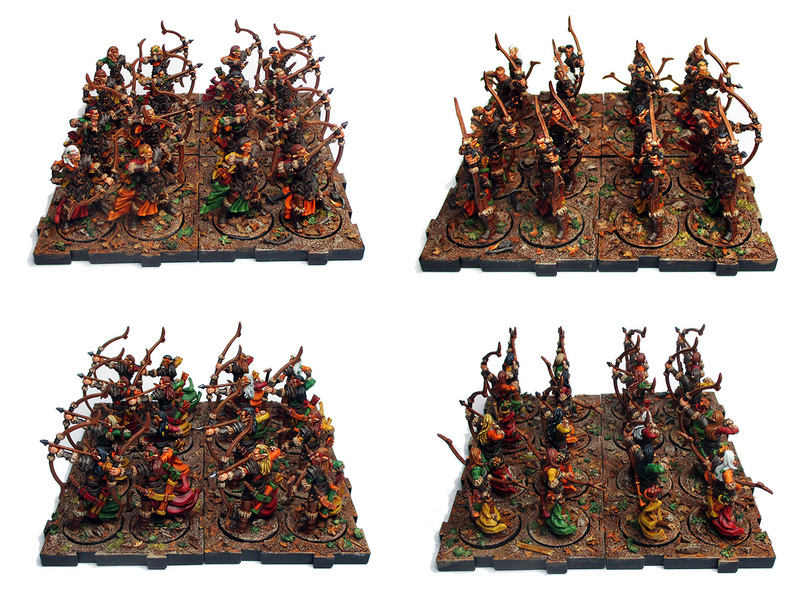 More elf painting... the Latari army box is complete, yay! They only need a coat of matte varnish - but the weather doesn't allow spraying at the moment so that has to wait.